Parallel to the investigation of intraoperative low-field MRI in several centers, two pioneering groups applied high-field scanners in the operating room environment. The major concepts are similar to those of low-field MR. For high-field scanning, a dedicated system for intraoperative use was designed, the ceiling-mounted movable 1.5-T IMRIS scanner, in Calgary by Sutherland (48-50). Hall and Truwit in Minneapolis adapted a standard 1.5-T Philips scanner to the operating room (51-54). High-field MR systems offer not only the possibility of shorter scanning times and better image quality but also a broader spectrum of sequences, as well as the application of further intraoperative MRI modalities. High-field systems provide MR angiography, diffusion- and perfusion-weighted imaging, and functional and spectroscopic imaging (49-53,55). 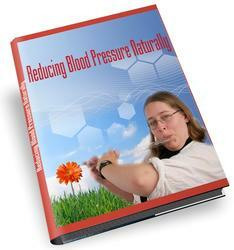 Whether all these modalities can be applied during surgery remains to be investigated. Since intraoperative image quality and sequence spectra of the low-field scanners could not compete with the routine pre- or postoperative imaging quality, being performed with high-Tesla machines, we decided to develop a new concept to adapt a high-field MR scanner to our operating environment, preserving the benefits of standard microsurgical equipment and microscope-based neuronavigational guidance with integrated functional data. Active magnetic shielding of modern high-field MR systems results in a steep decrease in the magnetic field, so that the 5-G line is close to the scanner, facilitating the intraoperative application of these high-field MR scanners. Thus, our concept of surgery in the fringe field (21,23) can also be applied for high-field scanners. In close cooperation with the Siemens Corporation, we evolved this concept further. A rotating MR-compatible operating table was adapted to a 1.5-T high-field scanner. For surgery, the patient's head is placed at the 5-G line; for scanning, the table is rotated and the head is moved into the center of the scanner. This allows microsurgery with fully integratedmicroscope-basedneuronaviga-tional support in combination with intraoperative high-field MRI. 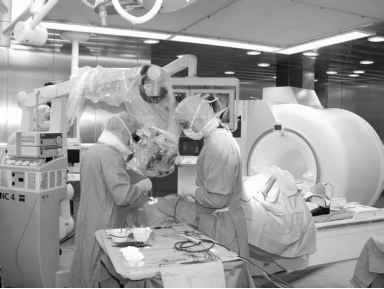 Between August 2001 and March 2002, our intraoperative MR operating room was reconstructed. The first patients wereoperatedonattheendof April2002. Fig. 3. 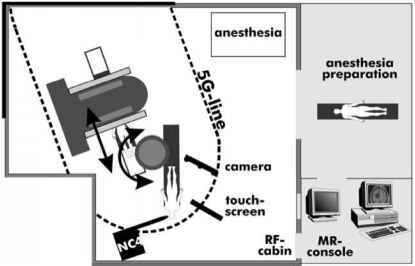 Operating room setup for intraoperative high-field MR imaging: a rotating table, which is locked at the 160° position, allows surgery in the fringe field, where the NC4 microscope is placed, and a ceiling-mounted neuronavigation system (VectorVi-sion Sky) with a camera and touch screen is integrated into the RF cabin. of the operating theatre. Electrical support is adjustable from outside so that in case of artifacts during measurements, designated equipment can be shut off. A rotating OR table (Trumpf, Saalfeld, Germany) is adapted to the 1.5-T scanner serving as operating table and MR tray. It permits free adjustments of the head position; elevation and side rotation are also possible. During surgery the head is placed at the 5-G line, and the table is fixed at the 160° position; for scanning, the table can be turned around and the patient placed in the center of the scanner in less than 2 min (Fig. 4). The head can be fixed in an MR-compatible head holder, which is integrated into the standard head coil (Siemens) (56). The NC4-Multivision microscope (Zeiss) is placed on the patient's left side in the fringe field. Extensive testing at the Siemens labs showed no artifacts generated by the microscope during scanning, and navigation was not influenced at the 5-G line by the magnetic field. For scanning, the microscope is switched off. Neuronavigational guidance is provided by the VectorVisionSky navigation system (BrainLab, Heimstetten, Germany). The camera tracking the position of the microscope in space and the touch-screen to operate the navigation system are ceiling mounted (Ondal, Hünfeld, Germany). Neuronaviga-tional accuracy is not impeded by the fringe field. At the main operating position, functional microscope-based neuronavigation with integrated data from MEG or fMRI is available. Fig. 4. (A-D) A rotating OR table, which allows elevation and side rotation, is attached to the scanner (1.5-T Magnetom Sonata), and the table is turned from the operating position (A) to the scanning position (D), allowing scanning in less than 2 min after surgery is stopped. 17.4-inch flat screens (AS4431D, Iiyama, Nagano-shi, Japan) display the MR console and the microscope video. A remote console is placed in the RF-shielded operating theater, allowing operation of various PC hardware from inside the operating room, e.g., for intraoperative functional measurements or neuroelectrophysiological monitoring (57). From the end of April 2002, more than 30 patients were investigated over 3 mo, mostly glioma and pituitary tumor cases. The new design with the adapted rotating OR table prooved to be very convenient; intraoperative imaging could start in less than 2 min after completion of surgery. Since all anesthesia lines go over the pivoting axis of the table, no time-consuming rearrangement is necessary. When the patient is placed inside the scanner, biopsy procedures can be monitored online. In transsphenoidal surgery a standard large flex coil is taped around the head, so surgery is not impeded. Figure 5 displays the OR setup in transsphe-noidal surgery. A typical example for evaluation of pituitary adenoma surgery is depicted in Fig. 6; complete adenoma removal was confirmed by intraoperative high-field MRI. Figure 7 illustrates the high intraoperative image quality, with clear delineation of the pituitary stalk and the optic chiasm. In transcranial surgery, the patient could be placed supine and prone, so the head could be fixed at various angles without major problems (Fig. 8). Refinements of the combination of head coil and head fixation, which will allow more flexibility, must be developed. Figure 9 depicts the intraoperative imaging of a typical glioma case, with various sequences revealing complete tumor removal. Fig. 5. Intraoperative setup during transsphenoidal surgery. The neurosurgeon is standing behind the patient's head. adenoma removal T2-weighted half-Fourier single-shot turbo spin-echo (HASTE) sequences give a reliable impression of the extent of removal after 5 s (Fig. 6A and C). Shorter overall scanning times allow the measurement of more detailed protocols in an acceptable time frame. In contrast to our former 0.2-T system, the high-field system offers a wide range of different sequences, including spectroscopy, echoplanar imaging, and diffusion-weighted imaging, which additionally will all be integrated into the navigational setup. The navigation system VectorVision Sky, which is ceiling mounted and integrated into the RF cabin, was used without any problems. Intraoperative updating of the navigation data was easy, so the effects of brain shift could be compensated for.